14K yellow gold puffy heart pendant from our Gold Heart Pendants collection. Heart measures approx. 9/16" wide x 3/4" tall with hoop. 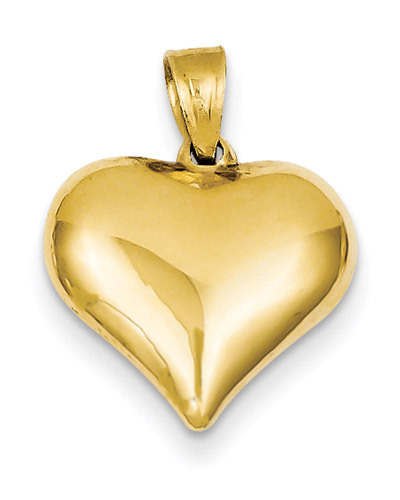 There's no mistaking the message behind this 14K gold heart pendant. This elegant piece portrays the timeless symbol of love in equally timeless fashion as a gleaming heart dangles elegantly from a shining bale. Its simple shape makes the beauty of the 14K yellow gold from which this piece is crafted. This classy emblem of affection measures 3/4" tall, including the hoop that holds it, and 9/16" wide, allowing it to communicate love in versatile, beautiful fashion. We guarantee our 14K Gold Heart Pendant to be high quality, authentic jewelry, as described above.